Upcountry Land and Tree provides quality tree removal, grading, logging, and landscaping in South Carolina's upcountry. Welcome to Upcountry Land and Tree! We provide quality tree removal, grading, logging, and landscaping work in South Carolina's Pickens and Greenville counties, and beyond. 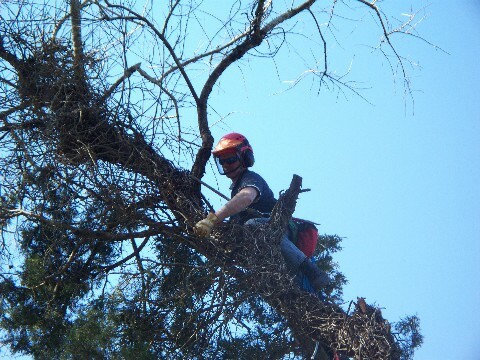 At Upcountry Land and Tree, we provide complete, natural tree care—we inspect and safely remove dead trees, prune overhanging limbs, and much more, to keep your property both safe and beautiful. When a project gets large enough, it can be converted into logging—where we pay you for the logs obtained while clearing a lot, or return some of those logs back to you in the form of lumber for hardwood floors, etc, in building your house, or for other projects you may have. We also offer excavation and grading services, and have a variety of equipment to dig trenches, prepare house foundations, and more. Upcountry Land and Tree also provides limited landscaping services, with a focus on hedge and shrub pruning, dirt moving, and installation of retaining walls, paths, and steps. We offer free estimates and honest, quality work in Pickens and Greenville counties, and beyond. To get your free estimate, click here! To learn more about our services, just click on one of the links below.